Parkinson’s disease (PD) is an aging-related movement disorder mainly caused by a deficiency of neurotransmitter dopamine (DA) in the striatum of the brain and is considered to be due to progressive degeneration of nigro-striatal DA neurons. Most PD is sporadic without family history (sPD), and there are only a few percent of cases of young-onset familial PD (fPD, PARKs) with the chromosomal locations and the genes identified. Tyrosine hydroxylase (TH), tetrahydrobiopterin (BH4)-dependent and iron-containing monooxygenase, catalyzes the conversion of l-tyrosine to l-3,4-dihydroxyphenylalanine (l-DOPA), which is the initial and rate-limiting step in the biosynthesis of catecholamines (DA, noradrenaline, and adrenaline). PD affects specifically TH-containing catecholamine neurons. The most marked neurodegeneration in patients with DA deficiency is observed in the nigro-striatal DA neurons, which contain abundant TH. Accordingly, TH has been speculated to play some important roles in the pathophysiology in PD. However, this decrease in TH is thought to be secondary due to neurodegeneration of DA neurons caused by some as yet unidentified genetic and environmental factors, and thus, TH deficiency may not play a direct role in PD. This manuscript provides an overview of the role of human TH in the pathophysiology of PD, covering the following aspects: (1) structures of the gene and protein of human TH in relation to PD; (2) similarity and dissimilarity between the phenotypes of aging-related sPD and those of young-onset fPD or DOPA-responsive dystonia due to DA deficiency in the striatum with decreased TH activity caused by mutations in either the TH gene or GTP cyclohydrolase I (GCH1) gene; and (3) genetic variants of the TH gene (polymorphisms, rare variants, and mutations) in PD, as discovered recently by advanced genome analysis. This study was mainly supported by Grants from the Ministry of Education, Culture, Sports, Science, and Technology of Japan and the Grants from the Health and Labor of Japan. 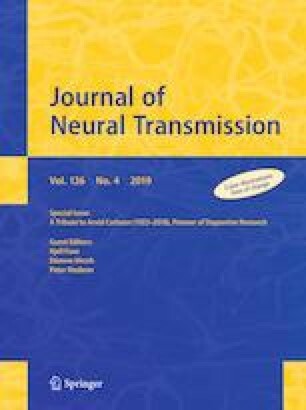 We would like to dedicate this manuscript to Dr. Arvid Carlsson, founding Editor-in-Chief of the Journal of Neural Transmission, who recently celebrated his 95th birthday, and to the late Dr. Ulf von Euler, who discovered noradrenaline as a neurotransmitter of sympathetic nerves in 1940. Intrigued by Dr. von Euler’s discovery of noradrenaline in the sympathetic nerves and Dr. Carlsson’s discovery of dopamine as new neurotransmitter in the brain, Toshi Nagatsu started his life-long study on catecholamines. We also dedicate this manuscript to the memory of the late Dr. Sidney Udenfriend of the National Institutes of Health, Roche Institute of Molecular Biology, and Drew University, to the late Dr. Julius Axelrod of the National Institutes of Health, and to the late Dr. Keisuke Fujita, Founding President of Fujita Health University. Toshi Nagatsu discovered tyrosine hydroxylase with Dr. Sidney Udenfriend while at the National Institutes of Health. Toshi Nagatsu also thanks all of his former colleagues and international collaborators described in References, especially Drs. Ikuko Nagatsu, Makoto Sawada, Chiho Sumi Ichinose, Toshikuni Sasaoka, Makio Mogi, Takahide Nomura, and Akira Ota, as well as Dr. Peter Riederer, the former Editor-in-Chief of Journal of Neural Transmission, for their collaboration over these many years.